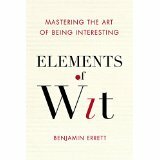 I’m reading Elements of Wit by Benjamin Errett. It’s a very interesting book with some surprising stories in it. I’ll write a longer blog post about it by the end of the week. In the meantime, here is something that most writers will appreciate: a witty dedication. Also, a couple of fun quotes. I’d not read Eliot, Auden or MacNeice. If you have the time, I recommend you read the whole book. It might not make you as witty as Oscar Wilde or Winston Churchill, but it will give you some good laughs.